Linus Torvalds and the early supporters of the Linux project were interested primarily in a free-as-in-beer operating system, not ensuring that source code would be freely accessible. Open source is all about sharing, keeping code open and providing universal access. That, at least, is the received wisdom that has helped guide open source programmers and companies for the last two decades. But a look at the history of open source projects such as Linux suggests that sharing and openness were not actually the primary motives of their founders. Here's why. N.B. : This is the first in what will, with any luck, turn into a series of posts about the history of free and open source software, which I am researching for (what will hopefully become) a book. I thank my ever-generous editor here at The VAR Guy for, first, allowing me to take a break from coverage of day-to-day open source news items to work on this book and, second, letting me use this site as a platform for exploring some of the ideas that are emerging from my ongoing research. Update: In an email dated April 27, 2015, Richard Stallman asked me to make clearer the distinction between GNU, the Free Software Foundation (FSF) and open source. As he correctly pointed out, GNU is not a movement; it is an operating system. The FSF is the movement. Further, according to the email, Stallman is "not a supporter of open source; what I stand for is free software. What I say is an example of the thought of the free software movement." Lastly, Stallman states that his impetus for developing GNU was "a rejection of proprietary restrictions on software, not commercialization as such." In light of these statements, this article should be read as an observation primarily about the early history of Linux and the self-defined open source movement that launched in 1998, rather than about GNU and the FSF. Since the introduction of the term "open source" in the late 1990s, the movement's founders have positioned the sharing and openness of code as the sine qua non of open source software development. Eric S. Raymond, in his canonical essay, "The Cathedral and the Bazaar," contended that the sharing of code made development more efficient, since, "given enough eyeballs, all bugs are shallow." A similar line of reasoning predates Raymond's rise to prominence, and even the introduction of Linux. As far back as the early 1980s, Richard Stallman, the founder of the GNU project and the man some authorities have called the "last true hacker," declared that the source code of software should be freely shared because "the Golden Rule requires that if I like a program I must share it with other people who like it." So, from an early date, advocates of open source development argued that open code is essential for two reasons: First, it's simply a superior way to program; and second, there's a moral imperative to share. That all sounds grand. And it's certainly true that both the functional and moral dimensions of open code are key motivations for many open source programmers today. But here's where the history gets complicated: If you look at what the early GNU and Linux crusaders were saying about their work, and read beyond the occasional references to the functional and moral imperatives of keeping code open, it becomes clear that the sharing of code was only a secondary consideration—or, in some cases, not even something the leading figures mentioned at all. When Linus Torvalds, the creator of Linux, famously announced in a newsgroup post in August 1991 that he was "doing a (free) operating system"—which, at the time, had no name, but which in short order became known as Linux—the message was all about making it free as in free beer, meaning the new OS would not cost anything to use. No one was talking about the code being open, or otherwise using the adjective "free" to mean freely shared. 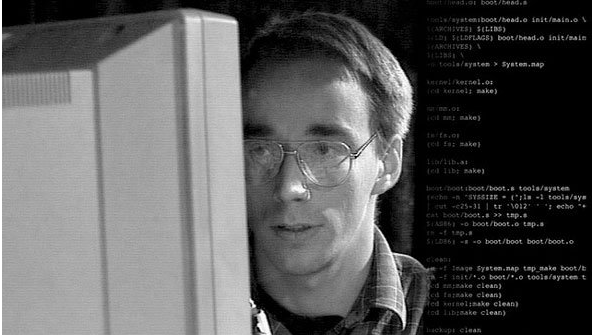 In the very first response to Torvalds's post, a user wrote to express interest in the Swedish-speaking Finnish grad student's work, noting that, in contrast to Minix, the prevailing Unix-like OS for personal computers before the advent of Linux, Torvalds's new OS was going to be free. Again, the word meant "no-cost," not "open source." The mantra about sharing source code did not develop until later in Linux's history. And the arguments that are familiar to open source supporters today coalesced only in the late 1990s, when Raymond and other collaborators officially launched a campaign to promote "open source"—a term which, by the way, was not even invented until 1998, long after Linux's founding. It's also telling that, initially, Torvalds released Linux under a license that simply prevented users from making money off of it. It wasn't until later that he adopted the GNU General Public License, or GPL, that Stallman and his cohort had created to keep software code publicly accessible, regardless of whether it had a commercial use. But that's all fodder for a longer post—or, fingers crossed, book chapter. Until then, thanks for reading. Perhaps in older age and wisdom his mind matured to the point of recognizing the importance of the code being open to all, not to say perhaps also realizing he needed help and the mind and work of others to take it further and make it what it is today. This article feels like an attempt to retrofit Linux to be something it never became. At the time ‘open source’ was a relatively novel idea that many saw as undoable, reading this insinuates ‘good works’ was never intended. This is equivalent of telling your child they were an unwanted accident. how many people contributed to the linux kernel before it was released under the GPL? and how did those numbers grow after the license change? not an objective measure, because i believe the license change coincided with hosting the code on a more public server, but still. it would be interesting to know the motivations for the individual contributors. maybe you could ask them? just because linus was looking for a free-drink OS, it doesn’t mean that everyone else was too. of there was a birth of open source, it was then. and the motivations where different at that time than they are today. Hi, Chris, first let me say English is not my native language, but then exactly for that reason I might contribute a useful point of view. IMHO the free/free confusion in English is specially terrible for a discussion about what is Free software and what is merely Open Source. In this particular discussion, it’s not clear to me when Jyrki says “I for one would like to port it to my Amiga (Mach needs a MMU and Minix is not free” whether he’s (*) referring to Minix being unaffordable or the need to get a license to use it on other machines; since Linus mentioned it is free from Minix code, that second option seems more probable to have piqued Jyrki’s interest. OTOH, the relationship between the two meanings of the word “free” add to the problem: one might understand it is possible to be free as in Freedom but not as in beer; for practical considerations, when one considers the harsh economic realities of most families in the world, free as in beer really contributes to something free as in Freedom. For a student that certainly would apply, as I remember my own tribulations when I was young and could not afford any kind of computer. This discussion is very similar to that about expensive drugs being not effectively available to most people and how not having access to them might constitute an example of lack of Freedom, if not in concept but still as consequence. As for Stallman having gripes about commercialization, there’s plenty of material online in which we can read he has a very capitalistic attitude; he’s more concerned about rights than economical aspects apparently. That can be also perceived in his differences regarding open source: he focus on difficulties of keeping the source available with ultra-permissive licenses like BSD as opposed to more Freedom-demanding ones like the GPL. IMHO English brings a lot of problems to any discussion, not just here with these two concepts embodied in one single word. Dear Cristopher, your article is not entirely but almost completely flawed. The Stallman / Raymond era had never been about cost savings but about access to source code. These cats demanded access to programming source code so that out freedom could be guaranteed. The cost savings thing is the selling point of FOSS software into corporations where there is an innate distrust to any and all things open, be if information or code. Let me just remind you the SCO lawsuit where free software was routinely portrait as “communist” because it was “Freee”. Of course times change and the global financial crisis has made free software a viable alternative to businesses. Another thing of great interest is the fact that _ALMOST ALL_ of modern day internet services was built up open source software, from mail exchangers to DNS servers. Cost was never a consideration in the early times as there was _NO_ commercial software available to handle any of the above tasks… The era of internet commercialization from service to software found the Open Source movement well established. I do sincerely hope you get your facts straight before you continue labouring on your book. It would be barbaric to tear down a finished piece of literature. Linux is not a pionner of the free software movement. The free software movement is much older than Linux. Just because early Linux developers and users did not embrace the ideas of sharing code does not mean the pionners didn’t. Also cost is a great benefit of open source so why not enjoy it. i have a few concerns on the quotes made. This entire article is fairly poor in many ways, but when you claim that GNU was just some sort of reaction to commercialisation of UNIX you’re so wide of the mark I don’t even know where to begin. Go read Stallman’s own writings on the topic. He’s fairly clear and emphatic on his reasons for starting GNU, you don’t need to guess. You also seem to think that FOSS is some sort of new phenomena, when its the other way around: pretty much every early computer programmer shared code freely. FOSS is just a move back towards that normalcy. I’ll save you the trouble of writing a book. It’s been done already, and far better. Go read Steven Levy’s “Hackers”, Neal Stephenson’s “In the beginning was the command line” and Glynn Moody’s “Rebel Code”. There, that was easy. Origin of freely sharing information and software dates back to at least the early user groups of the 1960s (even late 1950s) that where formed to help members make better use of their computing hardware. Back then there wasn’t a lot of information much less software, even from the hardware vendors. The SHARE user group for IBM systems is one such example. There also DECUS for DEC systems and VIM for CDC. Much of this was “open” source code although not called that at the time. It should also be pointed out that early Unix software, especially related to the Berkeley Unix distribution, was widely shared in the late 1970s and 1980s. 9-track tapes were the primarly form of distribution but UUCP and the available networks (e.g. Arpanet) were also used for sharing and distribution (free) software. Some of the various early Unix user groups such as USENIX also helped to promote sharing software. For those who would like an account of the *actual* “early days”, please read Hackers by Steven Levy. That goes back to your genuine early days of the 1960s and early 1970s before there were even personal computers and it was definitely all about sharing code. Richard Stallman learned from that generation and was described as “The Last Hacker” in the book, as the whole original bunch from MIT and Stanford went off to get rich in the burgeoning PC era. Stallman was always about the freedom of the code. Sorry, didn’t see your comment till I posted this information also on the newest article repeating the non-sense written here. It is a shame we can get more real users to write for the general public. I do think this goes to show how confused people are about ‘ free software’ and similar. I don’t know if my prior comment got submitted or not. so here is another shorter one. Basically authors argument falls apart when it you consider that if gratis Unix was the sole motivation behind Linux, than it would have been trivial for anyone to simply pirate Minix. It would have even been much easier to buy Minix rather than create a whole new kernel from scratch. Sharing is the only plausible motivation why anyone would spend a lot of effort to create a free kernel. So your edit is incorrect. GNU is not an operating system by itself. That is why the whole bit is called GNU/Linux. Really should be Linux/GNU. Stallmans argument against this would be that GNU is the bigger part of the whole. Further, Stallman has always been about free as in open software — see my comments and refs. on your latest article. Money has never really been the major concern, it was usefulness. No programmer likes closed-source software unless they are the ones getting paid to write it. Then they are likely still using free or open source software in order to write it — particularly these days. I think the first thing that you should do before you write an article or a book on Linux is to install a Linux kernel from scratch. Perhaps the best way to achieve this, in a manner which doesn’t cause you to implode or otherwise hurt yourself, is to do the Linux from Scratch project. That way things would be a bit more laid out and explained throughout the process. The fact that you haven’t mentioned EFF is also strange to say the least. Specifically because they work on several of the key areas of openness and litigation regarding opensource and freedom in computing in general. I think another good source of information would be Redhats business model of service and support. It is free as far as freedom, but it is not free as in ‘free beer’. also, I forgot to mention. also, I forgot to mention. You can read Linus’s own words to understand what he intended – This should, hopefully, end the discussion about his intentions.